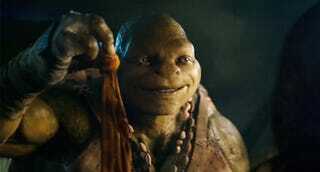 The comic creator who helped give Leo, Mike, Raph and Don their iconic looks isn't too sure about the human-like mouths and noses that they'll be sporting in the upcoming Teenage Mutant Ninja Turtles movie. …the changes to the basic design of the Turtles seemed to me to fall into the "fixing what is not broken" category. It's altogether possible that, in the context of this new movie, these designs will work well and not seem so odd, but I still point to what Jim Henson's "Creature Shop" team did with their rendering of the Turtles in rubber and paint as the best translation (in live action, anyway) of the Turtles as Kevin Eastman and I created them. …one of the big problems (for me, anyway) with the new look created for the upcoming movie — with those noses and very expressive lips, their faces look too human. Perhaps it is just my own personal preference, but the "noseless beak" look for the Turtles which Kevin and I used in all of our comics, and in pretty much all of the licensed material during the Mirage days (and which was really there from the very beginning, when Kevin drew that first "ninja turtle") is, in my opinion, a great way to immediately show that these guys are not human — they're mutated reptiles. Creatures. — TCRI canister jolted out of truck— canister bouncing off head of young guy saving old man from getting run over by truck— canister on new trajectory now hitting and smashing open glass container with the pre-mutated turtles in it— canister and turtles falling into manhole together— turtles crawling around in ooze from canister— Splinter (in pre-mutated form) observing all of this, and then getting into the ooze himself as he gathers up the turtles. I have always found that accidental, somewhat random series of events culminating in the creation of the TMNT to be a significant part of the charm of the story. Somehow, retconning it to make their origin the result of deliberate action seems like a mistake. However, perhaps the writers have found a clever way to make this seems more palatable. We'll have to watch the movie to find out. Laird's distaste for the change is pretty mild and, as one of the guys who created the amphibian reptilian martial artists, he's more entitled to his opinion than most observers. He's right in saying that most people haven't seen the finished movie yet and that these changes might work in a new context. And if they don't work, the original iterations of the Turtles are still around, ready to be enjoyed.